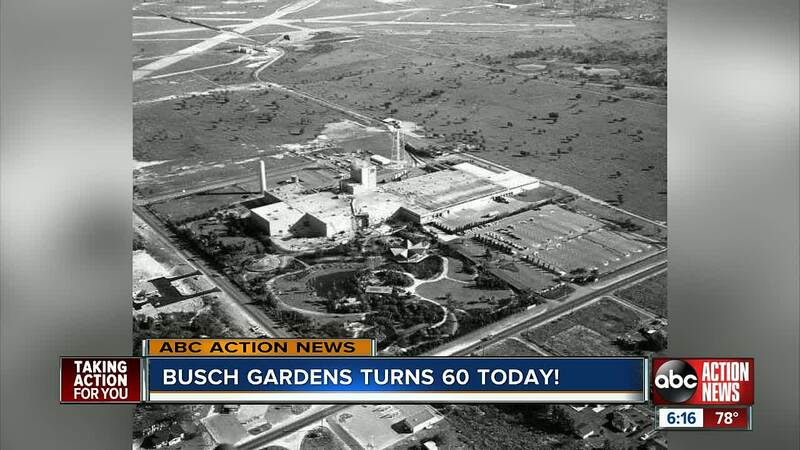 Busch Gardens is a Tampa Bay icon, and has been for 60 years. To celebrate the milestone birthday, the park is going back to it's roots with a year of beer. TAMPA, Fla. —) Busch Gardens is a Tampa Bay area icon, and has been for 60 years. To celebrate the milestone birthday, the park is going back to it's roots with a year of beer. Guests aged 21 and over who come to park in 2019 can enjoy two free beer samples every time they visit. Many don't know that today's park of thrill rides and animal habitats actually started as an Anheuser-Busch brewery and bird garden. The park's first roller coaster, Python, opened in 1976. Just a few years later, in 1979, Timbuktu followed. The 80s saw the park add the Scorpion, Congo River Rapids and the Tanganyika Tidal Wave. The Clydesdale Hamlet also opened at the end of the 80s and housed the famous Anheuser-Busch Clydesdales. The 2000s saw the park's first Howl-O-Scream, something they're known for today. In 2005, SheiKra opened. It was the world longest, tallest and fastest dive coaster at the time. The tallest free-standing drop tower in North America, the Falcon's Furry, opened in 20015. And just a year later, the park's first Food and Wine Festival took place. Now, the park is looking to the future with the opening of Tigris, the state's tallest launch coaster, later this spring.